The gods gave mortals the gift of magic. Misuse of this power almost destroyed the world. Now, children who exhibit magical traits are seized by the Arcane Council and sent to Taper Academy. To prevent a repeat of past tragedies, the students at Taper are taught a simplified form of magic. But not everyone is happy with such rudimentary knowledge. When Demetry, a promising young wizard, discovers a fire-damaged book hidden in the headmaster’s study, he can’t contain his excitement. The book is the Paserani Haote, an ancient spell book that contains the original teachings of the gods. Due to the book’s dangerous content, the Arcane Council ordered the destruction of all copies. Bored by the pace of his lessons and eager for a challenge, Demetry delves into the book’s dark arts. But when he fails to control the book’s most treacherous spell, it sets off a deadly chain of events that rocks Taper Academy to its core. Although Demetry’s crime is punishable by death, the Arcane Council inexplicably spares Demetry’s life. Instead of being sent to the gallows, he is sent to Coljack, a fortress prison built to house the kingdom’s most dangerous criminals. 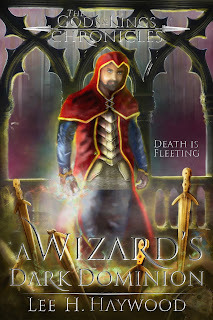 After the prison warden begins to put Demetry through a series of brutal tests, Demetry realizes the prison isn't what it seems, and the key to it all might be his mysterious new cellmate, a man who was once the most feared wizard of all.